Place potatoes in large saucepan; add enough water to cover. Add 1/2 teaspoon of the salt. Bring to a boil. Reduce heat to medium-low; cover loosely and boil gently for 15 to 20 minutes or until potatoes break apart easily when pierced with fork. Drain well. Mash potatoes with potato masher. Add butter, pepper and remaining 1/2 teaspoon salt; continue mashing, gradually adding enough milk for desired consistency. Though red potatoes usually aren’t the first potato people reach for when making mashed potatoes, due to their waxier texture, they can still be made delicious if it’s what you have on hand and you have this easy recipe at the ready. Slowly add the milk until you reach your desired consistency. A popular way to serve mashed red potatoes is to make the end result chunkier than your traditional creamy mashed potatoes, and with the skins on (that means no peeling for you!). There’s an added health benefit to this, too since the majority of a red potato’s fiber and vitamins come from its skin. Want more tips on how to perfectly mash your potatoes? 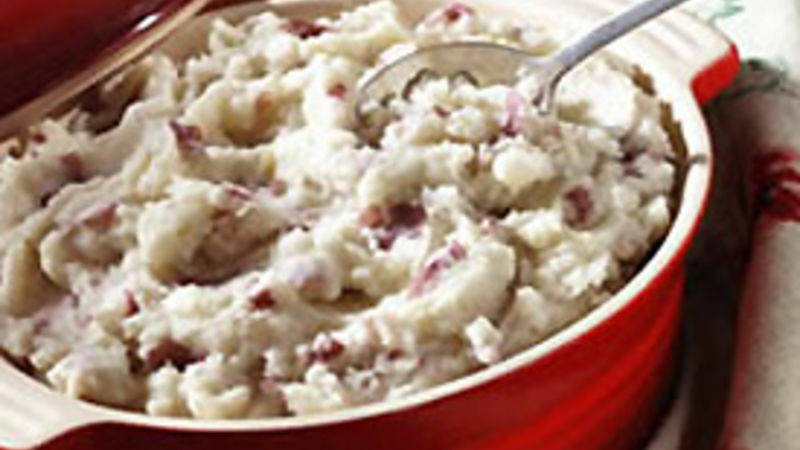 Read our how to make mashed potatoes article to become a tater expert. Then, try more delicious mashed potato recipes!